Smart ERP Solutions, Inc. (SmartERP), a leading provider of enterprise business application solutions and services, announced the launch of their new website, smarteverify.com. 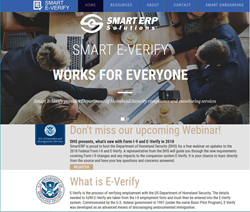 The new site allows visitors an easy way to learn about SmartERP’s E-Verify solution and how it integrates with their Smart I-9 and Smart Onboarding solutions. Some of the features within the new site include integration of informative content and news directly from the Department of Homeland Security, downloadable information and related collateral to assist visitors in understanding more about E-Verify and associated solutions. E-Verify is an Internet-based system operated by U.S. Citizenship and Immigration Services in partnership with the Social Security Administration. It provides an automated link to federal databases to help employers determine employment eligibility of new hires and the validity of their Social Security numbers. The Society for Human Resource Management (SHRM) is informing employers to get familiar with E-Verify, as it could soon be mandatory. E-Verify is already mandatory for federal contractors, some state contractors and employers that want to participate in the Science, Technology, Engineering and Mathematics (STEM) Optional Practical Training program when hiring foreign graduates of U.S. colleges. On February 15, 2018, Smart ERP Solutions will host a complimentary educational webinar with the Department of Homeland Security (DHS) – United States Citizenship and Immigration Services, featuring DHS analyst David Basham. Basham will present: “What’s new with Form I-9 and E-Verify in 2018,” covering requirements for the new Form I-9 and its companion E-Verify. Interested parties may register here. Smart ERP Solutions®, Inc. is a unique organization in the Enterprise Business Applications space providing innovative, cost-effective, and configurable on premise and cloud solutions and services that efficiently extend the capabilities of ERP systems to meet specific business process needs. Smart ERP Solutions enables clients to seamlessly integrate their people, processes, applications, and data across an enterprise, enabling the organization to streamline its operations and support business growth. Smart Onboarding is a robust new hire onboarding used by public sector and commercial organizations, large and small, solution that supports the talent you are hiring, regardless of whether they are contractors, temporary workers, or internal employees. Smart Onboarding supports industry best practices throughout the talent’s life cycle, including pre-boarding, onboarding and off-boarding. Smart Onboarding has an intuitive user interface that provides candidates, managers, and administrators an easy-to-navigate and consistent user experience. From the moment the new hire is invited to the onboarding process through the completion of the hire process, Smart Onboarding automates the tasks required based on the candidate’s hiring profile. The process is automated not only for the candidates, but also the managers, compliance team members, and any other administrators. Smart Onboarding also allows organizations to uniquely brand their organization and different lines of businesses—bring in colors, logos videos, and other content that will make the solution their own and create a personalized and unified onboarding experience for all new hires.